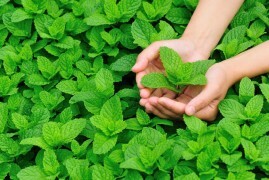 Who would not succumb to its intoxicating, fresh, sweet scent of peppermint ..
Mint is for us one of the most commonly grown herbs. If you fall in love with one of her taste and smell, it's probably the love for life, not just something to replace it. That's better, that grows "like a water" and is easy to grow. Normally a distinction is about 15 mints, but mostly they have on our bodies the same or very similar effects. We encounter leaved peppermint, klasnatou, water .. but surely the best known and most widely used is just peppermint. Have a mint on hand at home, whether fresh or dried, is not all bad. Its most common use in the form of a very delicious tea has a long tradition, not only because of taste and smell, but also very beneficial for our body. Peppermint tea stimulates the appetite, it is very suitable complement for loss of appetite and indigestion. If you can give after a meal, for example, when we hardly or perhaps come distended belly, in just a short while we will feel a pleasant relief. Peppermint generally supports digestion and has a calming effect on our metabolism, helps against pain digestive tract, expelling the spirits of the ball and promotes the formation of bile. This tea is also very useful for colds, flu and other respiratory diseases because of its anti-inflammatory and antiseptic effects and contained menthol makes breathing easier. Therefore, even inhalation of peppermint essential oil or brine very suitable supplement in the fight against respiratory diseases. Drinking peppermint infusion and inhalation acts as a calming agent in mental fluctuations, stress, headaches and insomnia feeling of tension. Peppermint oil we can freshen up your head, improve concentration, and lift your mood. For its disinfectant infusion is also effective in sore throat as a gargle, inflammation of the mouth, while providing us pleasantly freshen breath. It is appropriate to use it also in the form of tiles on minor skin injuries and skin rashes to accelerate healing. We collect individual leaves or entire leaves. The leaves can be harvested continuously throughout the vegetation, all tops then best just before flowering. Bale it in a thin layer in a well-ventilated room, drying in an oven or dryer temperature should not exceed 40 ° C in order to burn yourself active substance. Dried drugs are stored in a tightly closed container and used for teas and infusions or as spices. Dried leaves from the very drug has a relationship with the whole leaves a little more active substances, yet these substances in the stem still high quantities, so it pays to collect all the leaves. Peppermint herb is not only used for the purpose of healing. We can flavor it with salads, roasted and grilled meat and fish dishes, it can be used in dressings and sauces, herb butter to flavor rice or couscous. In Arab countries, enjoying a very popular spice product in the UK is again an indispensable complement of mutton meat dishes, in particular the Mediterranean is added to salads, fish and seafood, its use to flavor dishes is worldwide very diverse. Mint candies, chocolate fillings, liqueurs and other sweet fancy not forget. Article Herbal syrups treats we have seen the recipe for mint syrup. In the summer months it is an excellent foundation for a refreshing "water with the juice", then in the winter it can be added to teas and other drinks as well as prevention against colds during his treatment.